I haven’t been overly concerned with the Sad Puppies this year. I’ve talked about this before, but the general level of vehemence and craze among the more moderate puppy group had seemed to die down a lot with the turn of a new Hugos cycle. A few tweets went up regarding the Puppies list. I more or less ignored it. Lists happen, particularly with awards. It was a few days later that I noticed what was actually happening. The Sad Puppies list was up. Twitter basically exploded, albeit quietly compared to last time. The Sad Puppies list this year is considerably different from their past years’ lists, including in some cases more recommendations that nominating slots on a ballot. Note that though the original intent claim was to post ten works per category this didn’t happen, with more or less believability depending on category. It includes the usual suspects (Jeffro Johnson, the expected over-representation of Baen and Castillia House), but also includes Okorafor, Leckie, and Scalzi. If the Scalzi thing doesn’t raise your eyebrows, you haven’t been paying attention. In truth, the Sad Puppies list includes some authors really worthy of awards and beloved genre-wide. Unsurprisingly, authors have been requesting removal and posting objections to association with the Puppy Slate, including Alastair Reynolds, Cat Valente, and Peter Newman. Should the authors have been asked if they would like to be included? This is an interesting question. Normally, I would say no. But, the Sad Puppies aren’t just any old blog. Affiliated with the Rabid Puppies, Vox Day, and GamerGate, and the epicenter of last year’s fiasco, I think they should have. The Puppies’ lists and base are rooted in controversy. They know that. Last year’s slate led to withdrawal of nominees from the Hugo Awards ballot for the first time in decades. The desire to avoid affiliation with the Puppies runs strong and not without reason. While the Sad Puppies calmed their rhetoric a bit, it’s clear that the self-positioning as interlopers to SFF being kept out by “SJW” cliques is being maintained. Frankly, a good faith effort should have been made to contact every author listed on the SP recommendation list, regardless of past affiliation, leanings, or talk. There’s too much controversy for that not to be a minimum consideration. What was the response to those who asked to be removed? I understand that the admins are frustrated. I understand that there was some genuine effort to back off the rhetoric and open up the Puppies to more varied selection. And, some of the anti-Puppy folks can compete with Vox Day for vitriolic anger. But, you don’t become the Puppy ringleader without knowing that people don’t like what you’re doing or who you’re affiliated with. So, let’s not pretend that people requesting to be removed from the list are the “special snowflakes” and “delusional” types that Sarah Hoyt has called them on her blog. Hoyt is one of the Sad Puppy 4 coordinators\admins. She’s compared anti-Puppy folks to the Third Reich. Frankly, she would have been MUCH better served by putting an editors note that there’s a list of people who have been removed, posting the raw data from the forums, and then highlighting those who have been removed on the raw data file. I do think she has made a good, significantly more insightful point that people are giving her credit for. It’s hard to get past the anger and resentment in her post-reaction blog to see it, but she makes it clear: who’s really keeping women and minorities out of SFF? Publishers. It’s true. If everyone who spent the energy to tweet Sarah, Vox, or the other vehement sector of the Puppies on Twitter had spent the time to tweet Harper Collins, St. Martin’s Press, or Simon and Schuster about the lack of diversity in SFF, we may eventually see a more substantive change in the genre. By and large, the puppy ship is sinking. Maybe it’s time to focus on the people who control the genre more directly. Post-Script Note: I’m not discussing the Rabid Puppy slate today. Mostly because it lacks a sense of taste and appropriateness. Additional Note: The original post pointed to Nnedi Okorafor for having tweeted about the list. I was in error. My sincerest apologies. This entry was posted in Other, Thoughts and tagged Alastair Reynolds, Ann Leckie, GamerGate, Hugo Awards, nnedi Okorafor, PuppyGate, Rabid Puppies Slate, Sad Puppies, Sad Puppies Slate, Vox Day. It seems like every week (or more) another person lists the “history” or “best of” science fiction and fantasy while failing to mention women, people of color, or LGBTQIA+ contributors to the genre. Surprise. I’m not going to mention the particular posts prompting this. Suffice it to say that the past two weeks have been surprisingly full of them ranging from well-established bloggers to bookstore lists. While I find it difficult to imagine a full picture of science fiction and fantasy that doesn’t (at the least) include the works of Mary Shelley, Margaret Atwood, or Ursula K. Le Guin, the argument continues to be made that the “highlights” of SFF are largely male. Rather than raging against the machine, though that certainly has its place and I’m prone to do it, I’m going to highlight some authors you should try out to broaden your SFF horizons. Huzzah! Nnedi Okorafor is a Nigerian-American woman with a sense of the spectacular. Her most recent novella, Binti, is a fantastic examination of humanity at its most complicated. It takes the examination of race, gender, and their intersections to space and succeeds in every possible way. 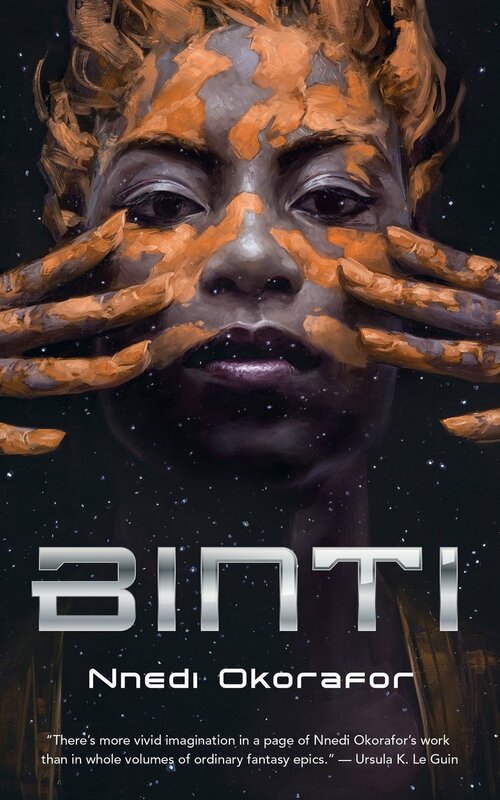 Plus, once Binti makes you fall in love with Nnedi, her backlist will make your soul scream (in a good way). Genevieve Valentine is an American author and comics writer. She has a wide range of stories, including The Girls at the Kingfisher Club, a retelling of the twelve dancing girls set in the 1920s and Persona, a futuristic political thriller. She’s a highly acclaimed author well worth the check out. Rachel Pollack is a transsexual woman who has had a large influence on feminist science fiction and fantasy, the women’s spirituality movement, and a wide variety of authors like Neil Gaiman. On top of her novels, she also wrote for DC comics. Her work is pretty surreal, mixing spiritualism with futuristic and fantasy elements. Her Temporary Agency is definitely the place to start for a temperate taste of Pollack’s works. Angela Slatter is an Australian author. While most of her works are short fiction, included in a number of short story collections and anthologies, you can also snag her stand-alone novella Of Sorrow and Such. She’s fantastic at creating heart-wrenching stories with complicated characters all in a short period of time. She’s got all the awards to prove it, and a contract for a full novel release this year. N.K. Jemisin is just fantastic. I’m just going to gush about her for a minute. N.K. Jemisin is an African American author with some amazing talent. Her newest book, The Fifth Season, is easily one of my favorite books of 2015. She blends non-western settings and characters with fantastic magic and world building. Her characters are ridiculously well developed. I can’t get over her. Go read The Fifth Season. You’ll see. Angelica Gorodischer is an Argentinean author whose works have been translated into English through Small Beer Press. She came into the scene in 2003 by way of Ursula K Le Guin, so you know it’s got to be good. Her stories focus on more than just the typical character and plot driven stories. They are fairytale like, with settings that act on the story as well as on people and a sort of wide-view of fantasy that’s hard to describe. Her Kalpa Imperial and Trafalgar collections are fantastic. I’ve yet to read her newest, but it’s on my list. Or, hey, maybe you know those guys. Here is a list of people on twitter (mostly bloggers and authors who promote, read, write, etc. diverse books. The list is short, but I plan on adding to and maintaining it. Please comment below with your suggestions for people to read, blogs to follow, and the like! This entry was posted in Thoughts and tagged angela slatter, angelica gorodischer, authors, Books, Fantasy, Fran Wilde, Genevive Valentine, LGBT, N.K. Jemisin, nnedi Okorafor, People of Color, Science Fiction, Ursula K Le Guin, Women. So, it’s not a secret that I’m a Nnedi Okorafor fan. I like her blend of fantasy, social commentary and emotional honesty. Binti boasts all of these traits. In her newest novella, a 97 pager unless my kindle lies to me, Okorafor tells the story of a young girl who leaves her village and people to go study mathematics among the stars. This is Okorafor’s first “Outer Space” story and I was ridiculously excited to read it. As in, staying up until midnight when it was downloaded on kindle and proceeding to read until two a.m. excited. Binti, is from a small cloistered village. Though her people are extremely talented mathematically they are isolated from the general population. Binti has never left her village. When she’s offered a spot off-world at one of the most prestigious universities, Binti decides to go against her family’s wishes and leave to pursue her education. But, going away from home is more dangerous than Binti had imagined and she’ll have to use her skills as a harmonizer to survive. Binti’s abilities in mathematics are really cool. She does what’s called treeing, finding the patterns in mathematics in a trance-like state. She also is able to tap into some really cool technology. Okorafor often talks about the way that we see other groups, especially those whose habits and appearance are clearly different than our own. One of the things I really liked about this is that Okorafor (1) doesn’t pretend that being among aliens will somehow magically turn the world post-racial, and (2) the treatment Binti receives from the dominant human group is problematic, but extremely subtle. Things like people touching Binti’s hair without asking or even knowing her create a subtle, but impactful sense of the culture. The story has a great sense of excitement, without being overly action-packed. Binti’s ship is boarded and while it is, at first, quite dramatic and violent, a lot of time is spent talking about the consequences of a violent boarding. In that way, I think it satisfies a lot of both the action and emotional factors I like in a story. There are some plot holes– communication between the aliens and the humans is supposed to be a fairly rare thing (only two people can communicate between the species), but there’s a treaty in place. Some of the story points could use some more development, particularly after Binti’s ship lands at University. Similarly, I could have handled more character development. Mostly those weaknesses come down to me wanting to see more of the world. The story is well done overall. I think this length was a bonus for Okorafor. She writes a lot of her short fiction and then expands on those stories to create her novels. I think this was a happy medium for her writing style. It was enjoyable, despite me thinking that some of the story points needed more development. This entry was posted in Reviews and tagged Binti, Books, nnedi Okorafor, Novellas, Reviews, Science Fiction, tor.com. If you didn’t know, I’m basically in love with Nnedi Okorafor. I want her to tuck me in and tell me stories at night and to be my best friend. You should probably know that before continuing on. Akata Witch, while featuring Okorafor’s fantastic creativity and wit, is not an adult book. It aims well at the 12-14 range. The story follows Sunny, a twelve year old living in Nigeria after having spent her first nine years in America. Sunny is often left alone or made fun of because she has albinism, a condition in which the skin lacks melanin, thus appearing white. This has set her apart from her classmates who call her akata, a derogatory word for people from the bush or to mark someone as an outsider unworthy or untrustable. Sunny’s family is very normal. Highly educated, they spend much of their time teaching their children to behave and ensuring that they’re educated. They are more severe with Sunny who is the only daughter. But, Sunny is different. Aside from her skin, her friends reveal that she is a Leopard Person, someone with magical powers and the ability to go between the regular and the magical world. Sunny then has to learn what this means, how to be a Leopard Person when the rest of her family was normal, and who she really is. All the while, a serial killer is on the loose. There’s a lot that this book has to offer. From complex, but approachable and genuine characters to an entertaining and detailed plot, I really thought Okorafor knocked this one out of the park. I know I like it, but the question is, will a younger reader (the intended audience) like it? I think the answer is yes. Okorafor creates a world that young readers will identify with: a kid who is fairly normal, if on the outside, who is thrust into an adventure that will change the world. Okorafor delves into west African and Nigerian folk-lore without assuming a great amount of knowledge or over explaining. She provides just the right amount of context for a reader, in particular a young reader, without leaving them feeling talked down to. I cannot speak of this highly enough. It leaves you with a sense of understanding and discovery. What’s great about Akata Witch is that it also offers a wide cast of characters and problems. Okorafor’s story features characters whose lives are different. They have distinct problems, dyslexia, albinism, an estranged family, narcissism. They are different genders and races. They succeed, but not without their own insecurities and challenges to test them. But all of the characters feel complete and their interactions and personalities grow with the story. Basically, this was a good read. It has it’s cheezy moments, but is a fun adventure with a lot to offer. This entry was posted in Reviews and tagged Africa!, akata, akata witch, children's literature, diverse reads, Fantasy, nigeria, nnedi Okorafor, sunny.